I’ve been seeking the “Holy Grail” recently and as is typically the case, coming up empty handed. So what constitutes a good photograph? Stupid question, I know. The answer is “a good photograph.” There is no answer other than, it all depends. But that doesn’t stop us from trying. As many wiser people have told me, or written, art is so subjective that if you’re aspiring to practice it, you are buying yourself an on-going confidence problem. Is it any good? Well, it really does all depend. You’re supposed to learn the rules of photography when you start getting serious, but then you’re supposed to break them routinely. My most recently I have been worshipping at the alter of simplicity. 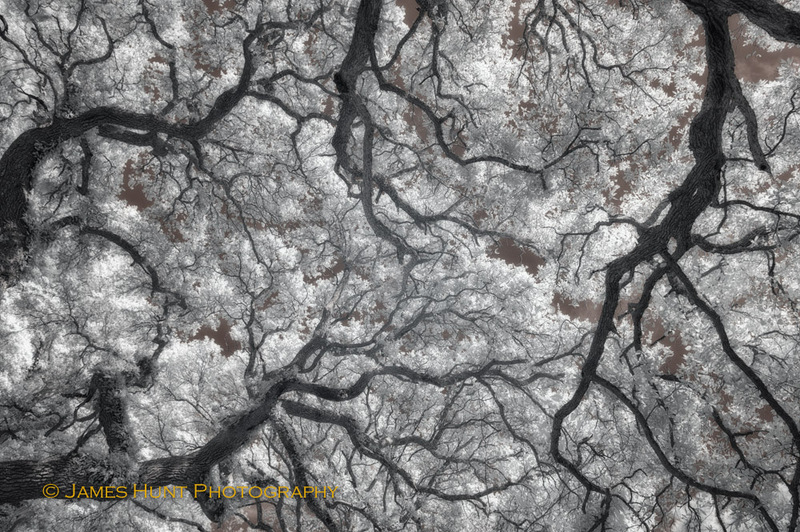 Edie Adams famously said that the best photographs are simple, they have just a one or two elements. You try to get everything else out of the frame. That little clump of grass has a true life of its own. It survives storm after storm, and it’s still there, by itself. 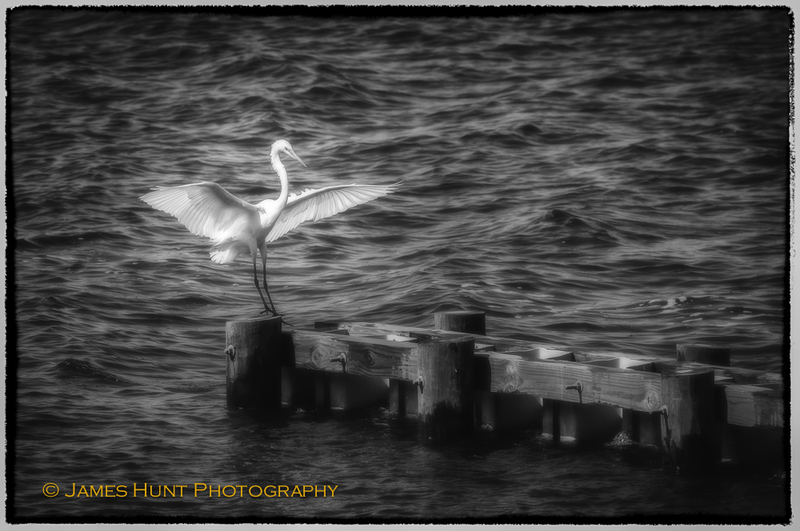 (All the images in this blog are from my recent trip to Manteo, on the Outer Banks of North Carolina. 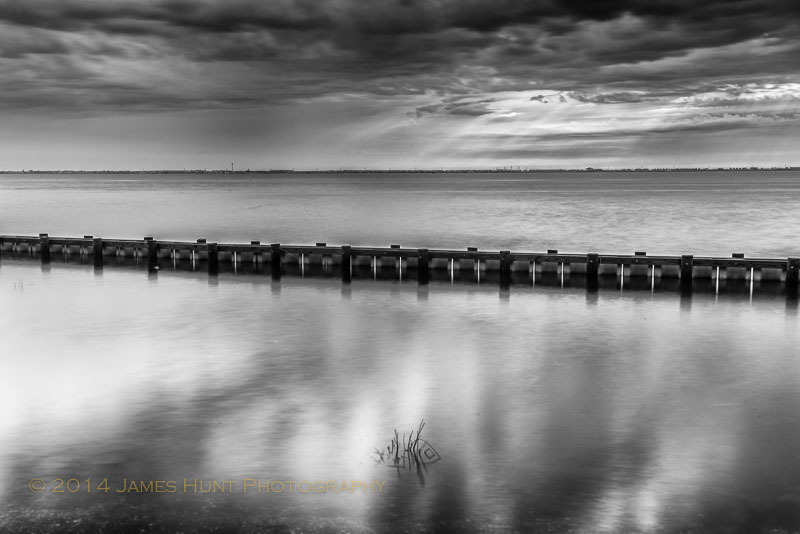 This is an early evening shot of Roanoke Sound.) There is a large bridge just to the right of the frame and closer to the photographer, on either side of the frame is significant and quite attractive foliage. There is very little beach. You just get a hint of the rocks in the fore ground. The image is then heavily cropped, albeit in the lens. 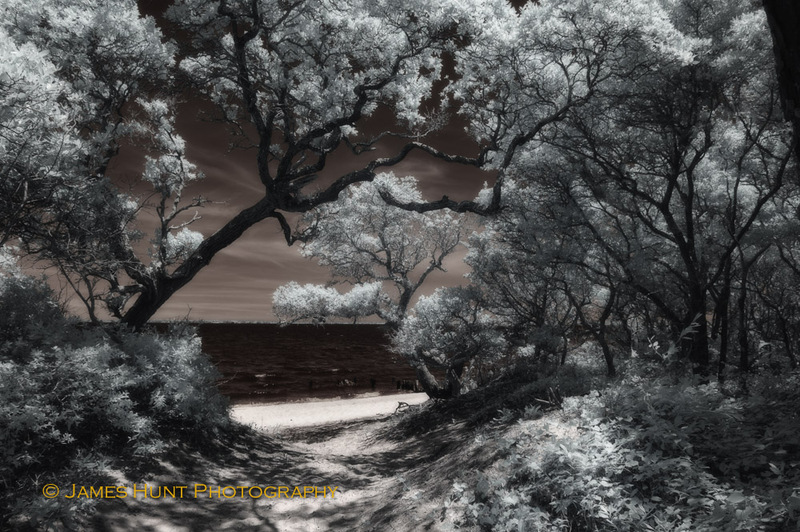 Here’s a somewhat messy location on the other side of the Island, overlooking Croatan Sound. I have cropped (in camera and in the digital darkroom) severely to simplify the image. This is a public location but it is poorly kept. This was actually the location of the Confederate Battery that was supposed to stop the Union Navy from capturing the Island and controlling sea access to North Carolina during the Civil War. The Confederates were shall we say not successful. I enjoy the simplicity of the image and the one or two elements (I guess you’d say four actually, counting the sky.) But can you live your life that way? Let me say it for you…”what the hell is that?” That is the bottom of the root system of an overblown tree, half submerged in the water. You find it along a charming nature walk at Pocosin National Wildlife Refuge in Columbia, NC, not far from the Outer Banks. It sits there, providing house and home for all sorts of critters. The Park Service will not touch it, and they shouldn’t. This tree is going to keep on giving for many years, even though it’s formal life is over. I find it joyfully complex, almost overwhelming. Who knows what’s going on in there at any given time. Probably a lot. Nature perhaps is not simple. There are indeed quiet and one could say simple moments of harmony, but the constant state of change we find in nature is neither simple nor harmonious. Photography and art more generally has to somehow grapple with those discontinuities. My pursuit of a perfectly simple world was off target. Glad I figured that one out. I had the pleasure several years back of spending a week with the great travel photographer, Bob Krist. Bob had spent considerable time and energy over the course of a career trying to understand what made for a great travel photograph, one that conveyed the “Spirit of Place.” This is also the title of one of Bob’s best books which you can order through his web site above. When I’m traveling now I think of his advice. I look for images that I hope will convey that spirit of place. It is actually quite a tall order, and you don’t get there by just taking snap shots. Three of the elements he said were key to a good travel photograph were, not surprisingly, composition light and color. The magic is in the fourth element, a sense of moment, something that captures what the place feels like. 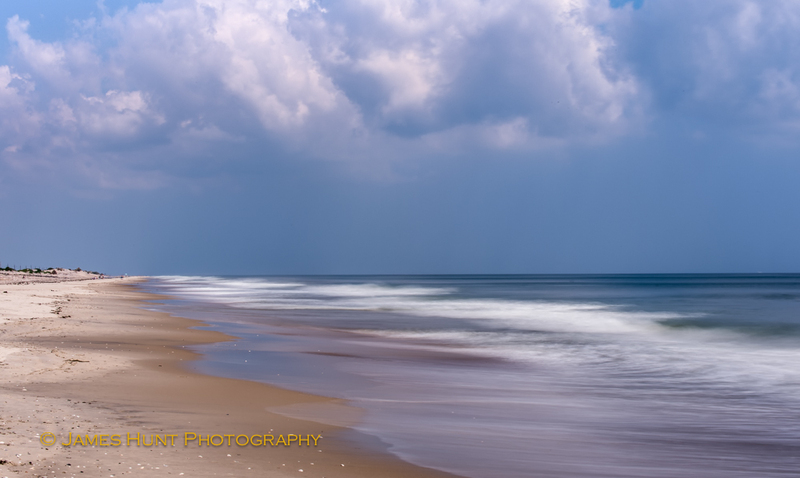 Here’s one view from the Cape Hatteras area, actually the beach at the Pea Island National Wildlife Refuge visitor center. It’s really not that hard to get away here, even though just a few miles north in Nags Head, the joint is teaming with visitors. Perhaps this is what most people think of when they think of this Cape this feeling. It takes you some place else, thankfully. If you are interested in Bob’s approach to travel photography, I am very happy to report that a video of his, Spirit of Place: The Art of the Traveling Photographer, has been legally posted here. This seems to be the only place it’s available. It’s worth the hour. Tech note, though it may seem inappropriate given the state of mind I hope the image invokes: This is a long exposure, about four seconds. To make this happen in the incredibly bright sunlight I had to pull out every trick I could think of. I had eight stops of neutral density over the lens, which was all I had. I was shooting at F36. So it comes out soft, who cares. I was at ISO equivalent of 50. My next move was to tar paper the lens. The fun part of course is that I couldn’t see the back of the camera at all. It was just too bright. I could just barely make out the histogram so I thought I might have a decent exposure, but could’t know until I got back to the car. Fittingly, it was just like shooting with film. This is Father’s Day in the U.S. so Happy Father’s Day to all involved. It is also Nature Photography Day, an annual event sponsored by the North American Nature Photographer’s Association, which has as its purpose to: “promote the enjoyment of nature photography and to explain how images have been used to advance the cause of conservation and protect plants, wildlife and landscapes locally, and worldwide.” (From the web site link here). Photography was used from nearly the moment of its invention (which is a moment hard to pin down) to build an awareness of our environment, or components of the environment, that so many can’t witness. It remains an important calling, even in an age in which we are inundated by images. So many of those images don’t tell a story, of any sort. It really is the story that counts. As luck would have it, I had a chance (with family) to spend some time roaming around the Fort Raleigh National Historic Site on Roanoke Island in North Carolina. This is the site at which the famed Lost Colony story unfolded. You may know the story, and I won’t recount it in any detail, but in essence, a group of English colonists were left on Roanoke Island in the late 1580’s to establish a business oriented settlement on behalf of the English Crown and associated entrepreneurs such as Sir Walter Raleigh. They were stranded and did not receive resupply for over three years. When the English returned after the three-year delay, the colony was gone. There was no sign of violence, or mass illness. The buildings were taken down (not torn down) and the only clue remaining was the name “CROATOAN” carved into a tree. To this day, a satisfactory theory backed by evidence regarding what happened has eluded scholars. Visiting sites like this is always an education. I was struck by several key points. First, the colonists had to find a way to live in harmony with their surrounding. They had to get along with the native Americans (who were already angered by previous unsatisfactory contacts) and they had to live off the land, off of nature. Sadly, they were ill-equipped to do either. Their ranks were staffed with those ready to exploit the environment, not come to terms with it: the military, miners, loggers, etc. Farmers and craftsmen were lacking. The colonists were prepared to exploit an environment that was simply not going to yield, for many reasons. Sound familiar? The colonists at that time were surrounded by lush maritime forests, as well as the familiar marshes and bodies of water we associate with the region. 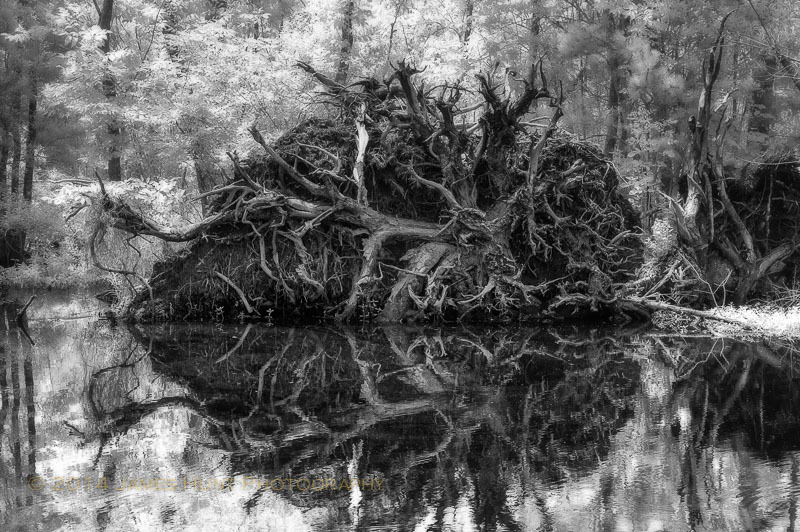 Many of those forests included the famed “live oak” tree that is iconic to the south. You will recognize them by their outward growth and the elaboration of their large branches into nearly a humanoid form. Old forest growths of these trees were nearly all taken throughout the south for ship building and lumber. The live oak is a very strong tree (used in the construction of Old Ironsides, the U.S.S. Constitution, for instance). So now in a few places you can find these wonderful trees. These shown here are obviously not four hundred years old, they’re quite a bit younger but this will give you some idea of what those forests were like. 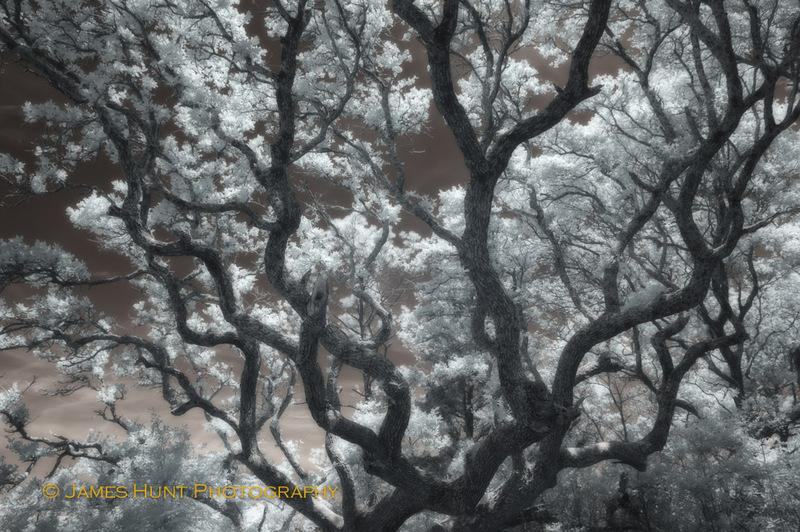 Away from preserves such as this, the live oak is still threatened by development. Conservation doesn’t have to be an all or nothing pursuit, though it is often thought of as such by some. Perhaps the Lost Colony will be found some day. 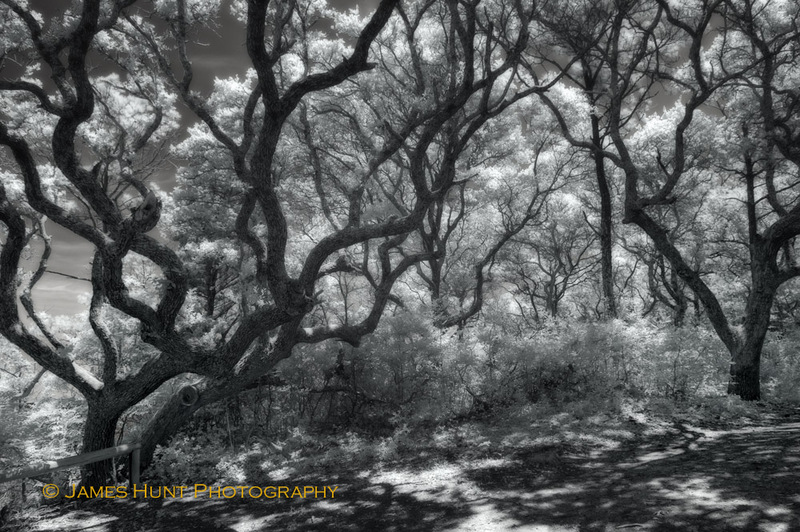 I’m going to be posting a new series of images from the Outer Banks of North Carolina. 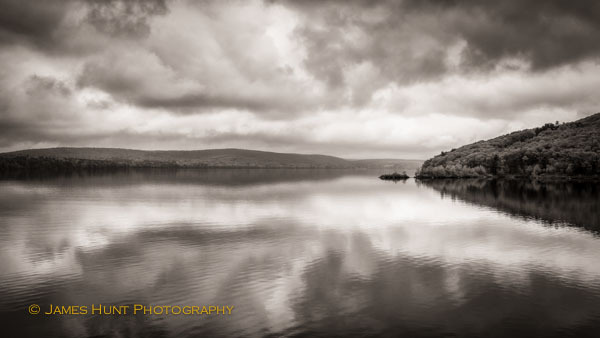 This is a wonderful location, but one that does not easily succumb to the photographic eye, at least my photographic eye. It’s a different kind of challenge. There is nature everywhere, and at the same time, there is considerable development as you can guess. The Outer Banks are barrier islands and these will move over time. Meanwhile, though, to a considerable degree there is some kind of harmony between people and nature, for now. Make hay while the sun shines. More to come. It’s looking like a peaceful summer. Hopefully lots of time for creativity. Now when am I ever going to learn not to jinx things. Oh well, that’s how it is looking, but we’ll see. From the top of Windor Dam at the Quabbin Reservoir, Belchertown, Massachusetts, on a day that shouldn’t have yielded such a peaceful image. 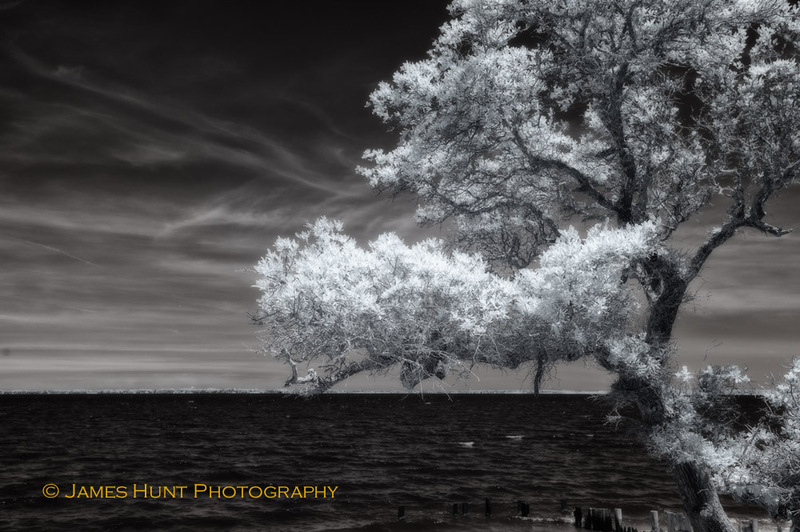 Welcome to the environmental photography and sustainability blog of James M. Hunt. Chris, my wife, and I care deeply about our natural environment and in particular those places, beings and phenomena that may not get the attention that they deserve, in spite of their importance. Since the places we tend to frequent may receive a bit less attention, we're often engaged in a process of discovery ourselves. We'll let you know here something of what we learn along the way. Thanks for taking the time to join us. 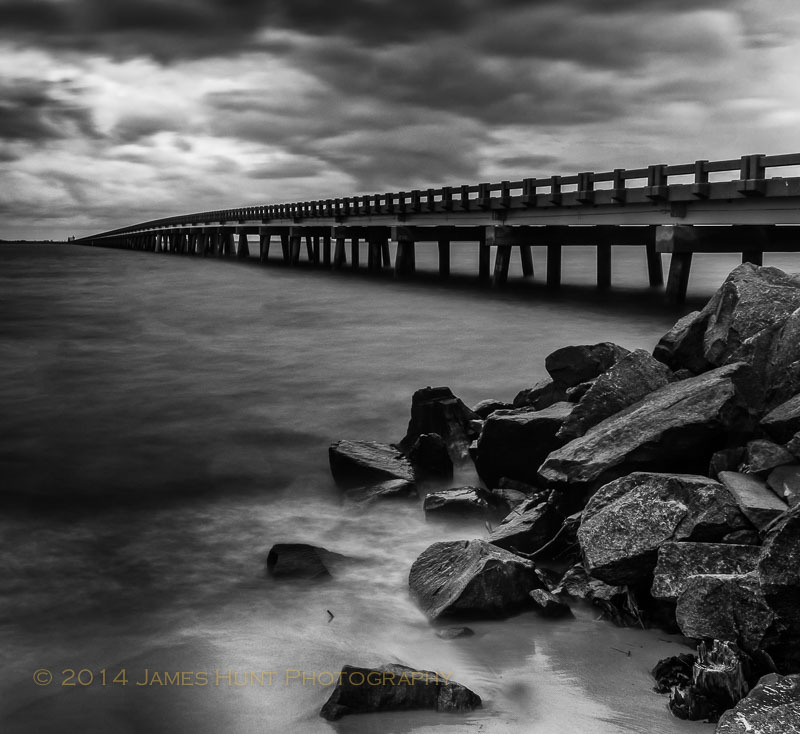 All images on this site are copyright (c) James M. Hunt, 2010 through 2018 all rights are reserved. No use of any image posted here without written consent. James is also the proprietor of Fine Art Printing of Westborough, a printing, scanning, and photo restoration business operating in Westborough, Massachusetts. You can see the link below. Inquiries are welcomed!